Whichever political party forms the next Government must prioritise police officers’ safety. That’s the view of West Yorkshire Police Federation Chairman Nick Smart, who has been at the forefront of efforts to change the law for people convicted of assaulting officers. Despite this, as yet there have been no changes to legislation on police assaults – something Mr Smart said has to change. 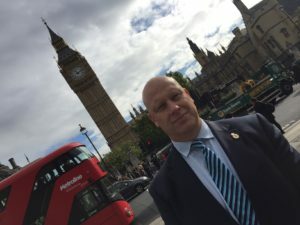 He said: “As officers may be aware over the past 12 months we have been lobbying MPs around officer safety in terms of trying to get the legislation changed to bring in stiffer custodial sentences for those who assault officers.We have had sponsored Adjournment debates and 10 Minute Rule bills in Parliament by Holly Lynch MP. Mr Smart also called for a reinvestment in the police service – which has undergone massive cuts to budgets and the number of police officers in the past six years. He added: “The new Government separately need to reinvest in policing after savagely cutting the service over the past six years. Demand has increased and is more far, far more complex than most people making the budgetary decisions understand. “It is not simply about crime , that is only 20% of what we do daily. “The new Government urgently needs to take a review of what modern police forces deal with daily in terms of mental health incidents, missing persons, modern slavery, domestic violence, human trafficking and counter terrorism incidents.